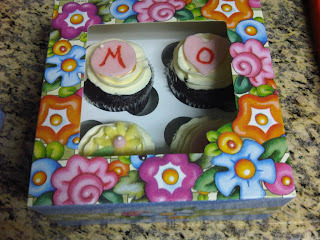 I wanted to throw something simple, easy, and fun together to surprise my mommy-friends on Mother's Day. Luckily, I only know a couple of mommy-friends so I can do this for them... in a few years, I won't be able to keep up with all my friends and their mommy-hoods! Haha! I bought these SUPER cute cupcake boxes from Michael's and was so eager to give them to my friends for this special occasion. 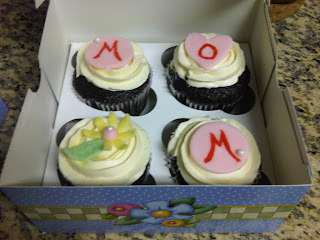 Made simple fudge chocolate cupcakes. I was going to use some fancy cupcake liner, but I got lazy. Haha. 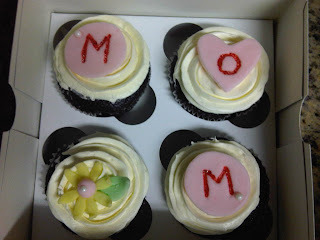 I was going to buy fancy fondant stencils for spell the word "mom" but they didn't have any in stock and I didn't feel like making another trip to my favorite, yet wallet-shrinking, store. 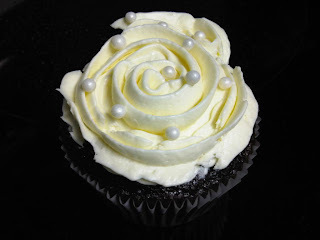 I did however find some pretty pearl sprinkles! I was planning on ordering some online, but I was happy to find them in stores! It took all my power (and then some) to stop myself from buying the gorgeous sugar pearl in every color. Ta-da! Simple, yet to the point!